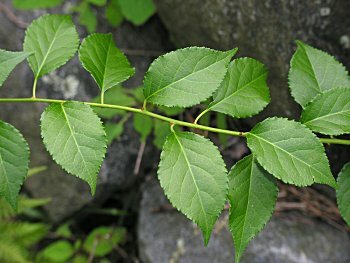 American Bittersweet is a native high-climbing vine, uncommon to occasional in the Mountains of North Carolina, rare in the upper Piedmont. The similar Oriental Bittersweet (Celastrus orbiculatus) is an increasingly common invasive that is outcompeting the native vine. 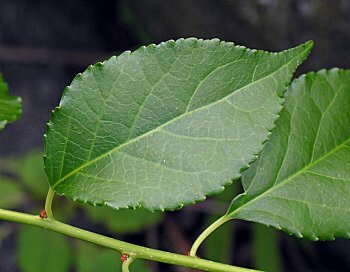 The alternate, deciduous leaves of American Bittersweet are narrower than the nearly round leaves of Oriental Bittersweet. 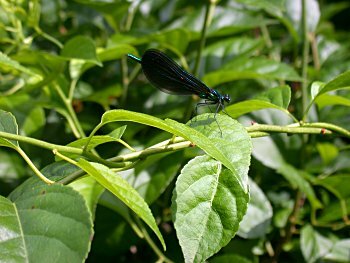 Because Oriental Bittersweet is so common, there are a large number of photos on the web that are labelled American Bittersweet, but are actually of Oriental Bittersweet. Orbicular leaf shape is a giveaway for Oriental. The flower arrangement is another clue -- those of American Bittersweet are in terminal panicles, while those of Oriental are in axillary cymes.